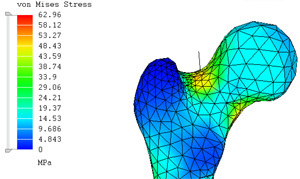 We offer force, pressure and contact loading analyses for bone. The mesh and the loading on a head of the femur (far left). The analysis confirmed that the Principal Stresses (middle images) predicted by the analysis corresponded to the trabecular growth patterns (far right). 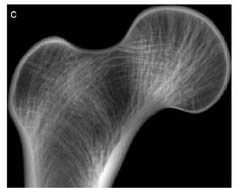 These growth patterns can be seen in the CT image to the right. 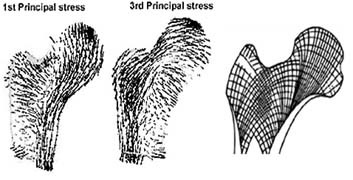 The von Mises Stress distribution can be seen in the image below.